Three quarters of a century elapsed between Ampere's definition of electrodynamics and Einstein's reform of the concepts of space and time. The two events occurred in utterly different worlds: the French Academy of Sciences of the 1820s seems very remote from the Bern patent office of the early 1900s, and the forces between two electric currents quite foreign to the optical synchronization of clocks. Yet Ampere's electrodynamics and Einstein's relativity are firmly connected through an historical chain involving German extensions of Ampere's work, competition with British field conceptions, Dutch synthesis, and fin de siecle criticism of the aether-matter connection. 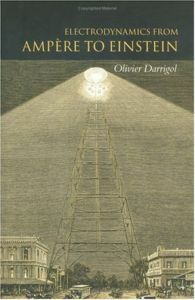 Darrigol's book retraces this intriguing evolution, with a physicist's attention to conceptual and instrumental developments, and with an historian's awareness of their cultural and material embeddings. This book exploits a wide range of sources, and incorporates the many important insights of other scholars. Thorough accounts are given of crucial episodes such as Faraday's redefinition of charge and current, the genesis of Maxwell's field equations, or Hertz' experiments on fast electric oscillations. Thus emerges a vivid picture of the intellectual and instrumental variety of nineteenth century physics. The most influential investigators worked at the crossroads between different disciplines and traditions: they did not separate theory from experiment, they frequently drew on competing traditions, and their scientific interests extended beyond physics into chemistry, mathematics, physiology, and other areas. By bringing out these important features, this book offers a tightly connected and yet sharply contrasted view of early electrodynamics.